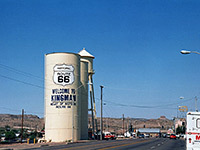 Kingman is the largest city in northwest Arizona, located by the major intersection of I-40 between Los Angeles and Albuquerque, and US 93 between Phoenix and Las Vegas. It also lies along Route 66, which still forms the main street, and continues into very scenic countryside to the west (the Black Mountains) and east (the Hualapai Indian Reservation and Peach Springs). The historic city center is relatively small, only about one mile across, as this is enclosed on most sides by steep hills that restrict development; a much larger area lies to the northeast, centered on three miles of Route 66, now known as Andy Devine Avenue. 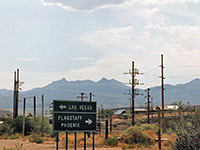 Downtown contains such sites as Route 66 Museum, Mohave Museum of History and Arts, and the Amtrak Station, but almost all facilities are to the east, including over a dozen hotels, concentrated around exit 53 of the interstate. 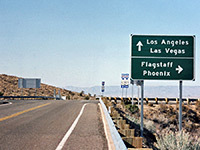 Kingman Airport is situated right on the north edge of the city, offering services to Las Vegas, Phoenix and Farmington. Unlike most hotels in Kingman, the Hampton Inn is located not on busy Route 66, but instead on a quiet side street one block from I-40 exit 51 (Stockton Hill Road), adjacent to the main shopping complex in town; Wal-Mart and Smith's supermarket are right opposite and there are many restaurants nearby. Also within walking distance are Kingman Regional Medical Center and Mohave County Fairgrounds. The inn provides free hot breakfast, with a take-out version for guests leaving early, and it has leisure amenities of a fitness center and indoor pool. The 86 good sized rooms are equipped with a refrigerator, work desk, coffee maker and free internet access. 3101 East Andy Devine Avenue is the location of the new SpringHill Suites Kingman (open March 2009) - part of the long line of shops, restaurants and other hotels along old Route 66, a mile or so north of the historic town center and one block from interstate 40. The all suite, 4 floor property has 73 studio suites complete with kitchenette (sink, microwave, refrigerator), sofa bed, executive desk, LCD TV, and the famous Marriott bedding which always ensures a comfortable night's sleep. Also available are a free breakfast buffet, heated indoor pool, whirlpool and fitness center. This hotel is the best choice for extended stay lodging in Kingman. The Holiday Inn Express in Kingman is regarded by many as the best hotel in town, on account of its clean & comfortable rooms, free deluxe continental breakfast, efficient staff, and the easily reached location, 1 block southeast of I-40 exit 53, along Andy Devine Avenue. The Holiday Inn Express has 75 north or south facing rooms & suites over three floors, a fitness center, indoor heated pool, hot tub and guest laundry. There are several restaurants within two blocks, and the historic downtown area of Kingman is 3 miles further southwest along old Route 66. One of several hotels along old Route 66 (now known as Andy Devine Avenue) in Kingman, the Best Western A Wayfarer's Inn is located half a mile south of exit 53 of I-40, on the west side of the road, adjacent to Tucker Street. The property has a motel design but enhanced by superior features like a high ceiling lobby with fireplace, and several types of suite in addition to the standard rooms. All accommodation is clean, spacious & quite recently renovated, spread over 3 wings enclosing a central courtyard with outdoor pool; most are quite far from the main road so provide a quiet night's sleep. This part of Kingman (2.5 miles from the downtown area) has many restaurants and small shops. The inn serves free hot breakfast. Virtually opposite the Wayfarer's Inn (at 2930 E Route 66) in northeast Kingman is another Best Western motel property, the Kings Inn & Suites. The Kings Inn offers broadly similar facilities at slightly lower rates; the main amenities are free continental breakfast, an outdoor pool, indoor hot tub, exercise facility, 24 hour front desk and guest laundry. The 101 rooms are clean and modern, all overlooking the parking area, and some have additional facilities like a microwave & refrigerator. Executive suites contain separate living/sleeping areas, plus a Jacuzzi bath. The Quality Inn of Kingman is built in the mostly undeveloped section of town that separates the historic downtown area from the eastern business/residential district - located at the south side of old Route 66 (Andy Devine Avenue), 2 miles from exits 48 and 53 of interstate 40. The Quality Inn offers above average free breakfast, while other dining is available from one restaurant adjacent to the hotel and several more within walking distance. Guests can relax in an outdoor pool, hot tub, fitness center and sauna. Many of the 98 rooms have fine views southwards towards the Hualapai Mountains. Although Ramada Kingman is close both to the railway and to I-40, many of the rooms enjoy a quiet setting, arranged around three sides of a central courtyard garden with outdoor pool. The property is partly surrounded by undeveloped land but is also just a short walk from a selection of restaurants. Shopping is close by, on the far side of the interstate. Free hot breakfast is available onsite; also complimentary is the local area shuttle, which serves locations as far away as Hualapai Mountain County Park, 13 miles southeast. Guest rooms with microwave & refrigerator are available. Also on the premises are meeting space, a restaurant and fitness center. Days Inn Kingman East is one of many small motels along old Route 66 towards the north side of town, with the traditional two floor, exterior corridor design, surrounded by a good sized parking lot. I-40 runs past half a mile south, and there are plenty of restaurants within walking distance, plus a selection of shops just opposite, including Bashas' supermarket. The only amenities are free continental breakfast, free wi-fi and a small outdoor pool, located at the rear, away from the main road. Pets are welcome, for a fee. Like most motels in Kingman, the Days Inn is located several miles northeast of the historic town center, along old Route 66, close to I-40 exit 53. Rooms, some of which are equipped with a microwave and refrigerator, are contained within an L-shaped, exterior corridor building on the north side of the main road, looking out across the parking lot and outdoor pool. Nearby are a selection of restaurants, small shops and other motels. Other facilities at the Days Inn are an indoor hot tub, free wi-fi and free continental breakfast. Of the many budget motels along Route 66 in Kingman, AZ, the Travelodge is one of the best, supplying simple, clean accommodation in a 2 floor building opposite Bashas' supermarket on the north edge of town - this is the last hotel before the highway enters desert lands en route to the Hualapai Indian Reservation. The main facilities are free breakfast, a heated outdoor pool, and some rooms with microwave & refrigerator. The Econo Lodge is also the closest hotel to Kingman Airport, 5 miles northeast (free shuttle available). Almost the northernmost hotel in Kingman, the Super 8 adjoins Route 66 close to the edge of the built-up area, just down the street from Basha's supermarket and a good selection of dining outlets. The three floor building is of modern construction, with interior corridors and ample parking space. Truck parking is available at the rear. The low rates are reflected in the small range of amenities: just free continental breakfast, guest laundry and a microwave/refrigerator in each room. Motel 6 Kingman East sits along Route 66 directly opposite Basha's supermarket and Kmart, plus various restaurants and smaller shops, within sight of the Peacock Mountains to the east and the Cerbat Mountains to the west. A line of trees helps shield the accommodation block from the highway, and rooms at the rear are especially quiet. The two-floor, exterior corridor building is surrounded by the parking lot and has an outdoor pool at one side, while inside, the only facility is a coin-operated laundry. The Motel 6 is one of the very few motels in downtown Kingman, located along Beale Street adjacent to several Mohave County offices, just down the street from I-40 (exit 48). There are many restaurants nearby, and a travel center on the far side of the interstate. Facilities are typically limited - guest laundry, wi-fi and free coffee - but rates are low and the motel is easily accessed. Accommodations are divided into two blocks, separated by the good-sized parking area. Selected rooms contain a microwave and refrigerator.